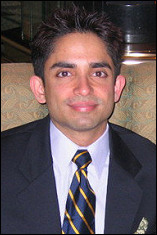 Dr. Gaurav Gopalan, a 2004 aerospace Ph.D. graduate, was found unresponsive on September 10th in Washington, DC and shortly declared dead thereafter in the Columbia Heights neighborhood he called home. Dr. Gopalan's death was ruled a homicide on September 20th and an investigation is in progress. It is a tragic loss for family and friends who knew Dr. Gopalan as an impassioned and spirited individual, as well as for the Clark School and the University of Maryland community. Dr. Gopalan was an Assistant Research Scientist in the Department of Aerospace Engineering and worked with Professor Fredric Schmitz. Dr. Gopalan was known and loved in multiple communities. As a graduate student, Dr. Gopalan was a member of the Graduate Lamda Coalition and, in addition to being a brilliant researcher, was known for his love of Shakespeare. A passionate thespian, he was an active member of the Washington Shakespeare Company, where he served as a director and stage manager. Dr. Gopalan was also the president of his own business The Fred Schmitz Group. A number of memorial events have been planned to honor Dr. Gopalan's life and memory. A campus candle light vigil is planned for Tuesday, September 27th at 6:00 p.m. The vigil, sponsored by the office of LGBT Equity, is open to the public and will be held at the sundial on McKeldin Mall. Those who would like to attend this vigil may contact Luke Jensen at 301-405-8721 for more information. The aerospace department is facilitating a private memorial service due to be held on Sunday, October 2nd. Friends and colleagues of Dr. Gopalan who would like to attend the October 2nd service may contact Erika Aparakakankanange for more details at 301-405-3457 or eaparaka@umd.edu.